As I strolled through the aisles of our new Sam’s Club with my jumbo-sized cart, I made some observations. First and foremost, I wasn’t aware that pig lips were a marketed product for human consumption. It boggled my mind further to know that someone would prefer this as a bulk item. Does pickled anything go bad if you don’t eat it in a timely manner? A few rows over, I came upon a 50-pound sack of rice and a 25-pound sack of red beans. Being a transplanted Cajunite, I can appreciate the importance of these staple items, but unless you’re a restaurateur or a doomsday prepper, I’m not sure what you would do with this much red beans and rice. 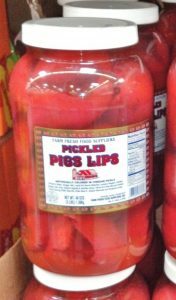 If you throw in some pickled pig lips, I guess you could have a nice block party. 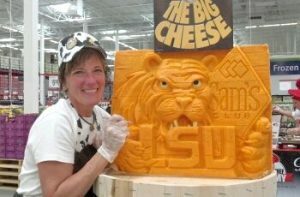 In the middle of the store, I found a huge block of cheddar cheese, sculpted into the LSU mascot. We have some pretty loyal fans here who would consider it their duty to consume every last chunk of this cheddar. Of course, I’m sure that even the most loyal fan could find a bulk buy of laxative, worthy of the challenge. While I’m on the subject of gastronomical distress, let me note that Sam’s has enough Preparation H in a single buy to soothe the hemorrhoids of a herd of elephants…who needs that much pain relief? Lastly, for all of you Macgyver wannabes out there, you can buy 2000 paper clips, 240 yards of duct tape and 5,400 pieces of gum for all of your disaster-averting needs. 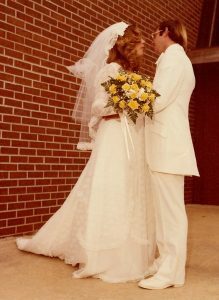 32 years ago today, my husband and I were married. It doesn’t seem that long ago…I remember it well. My 11 p.m. curfew was still in effect the night before the wedding; I was young and still living at home with my parents. We had out-of-town relatives staying with us, so my maid-of-honor and I slept on the floor…a back ache ensued. Morning came and it seemed I had plenty of time to pick up the cake and get my hair done, but how time flew! The wedding was to start at 3:00. Everyone was at the church by 2:30 except me and my maid-of-honor. She did our makeup at home and had to have one last spritz of hair spray because of the windy conditions. Being the klutz that I am, I smeared her makeup and almost blinded her with the hairspray. Before the mascara redo, we were already late. Because the wedding would not start without the bride, everyone patiently waited as I shimmied into my dress in record time and took my place in the back of the line behind my wedding party. Did you ever wonder why a bride wears a veil? I had my answer at the first sniffle from my dad, as we waited to make our entrance. My inner raccoon came out to play. Of course, if my dad hadn’t started the mascara marathon, hearing my groom serenade me during the ceremony surely would have started it. 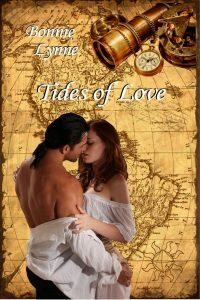 By the time we were introduced as husband and wife, my eyes were red and there was an unsightly glistening under my nose. My husband, being a properly trained, southern gentleman, offered me his handkerchief before the pictures were taken. It seemed the rest of the afternoon would go smoothly until I remembered I had forgotten my camera. I wanted to take pictures on our honeymoon and this was the time before cell phones with cameras or even those handy disposable cameras. My aunt saved the day by meeting us at a designated location to make the camera hand-off, but not before my husband almost ran a stop light in his tricked out Chevy Nova. I was hurled into the rice-littered floorboard–I said his car was tricked out, I didn’t say it had seat belts. We made it to Myrtle Beach in one piece and all was well until my husband had the great idea of going deep-sea fishing. I couldn’t swim and I had never considered stepping foot on a boat, but not wanting to be the party-pooper, I gave it a shot. Thank God it was only a half-day trip! I knew it was a bad sign when the boat crew began placing buckets at the end of every seat in the cabin. The milk and donuts I had for breakfast pitched and rolled right along with the boat as bad weather approached. If I hadn’t been so green when we finally made it back to shore, I would have kissed the ground. Vows were said again that week. I vowed that I would never again step foot on a boat! 32 years later, I remember it well. Happy Anniversary to my husband, Steve. Thanks for sticking around for the ups as well as the downs. I Love You the Mostest!!! 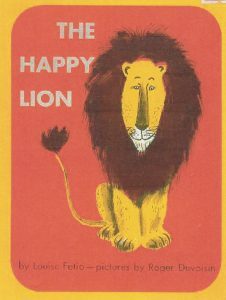 My favorite bedtime story, The Happy Lion, written by Louise Fatio and illustrated by her husband, Roger Duvoisin, is about a lion living in a French zoo. For me, The Happy Lion was an introduction to French culture and the moral: the grass is always greener on the other side of the zoo fence. 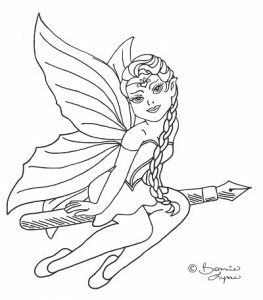 This 1954 children’s book gave birth to seven sequels and was the winner of the first Deutscher Jugendliteraturpreis, a German literary award. At age five, I didn’t care about the award or the sequels, I only knew that I wanted to hear it night after night before I went to sleep. 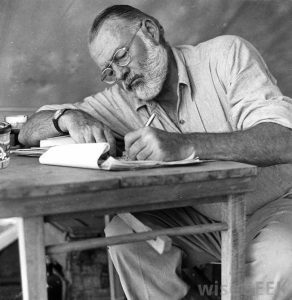 From The Happy Lion, I gained my love of the written word and I learned to say bonjour and au revoir in a slow, southern drawl.